After the new queen honey bee returns from a series of mating flights to the mating nucleus hive where she emerged as an adult a week earlier, she roams the combs for another week. Now, at about two weeks of age, the queen begins a life of egg laying. One queen is responsible for producing the entire population of the colony. The success of the colony depends upon the number of bees that she produces. The behavioral traits and many of the health characteristics of the colony are shaped by the genes shared by the queen and the drones she mated with. The organization of the colony as a social unit is built around the pheromones the queen secretes. If the beekeeper wants to control or improve the bee stock, it is important to identify the queen. Unless the queen is marked, there is no way to tell whether she has been replaced through supersedure. 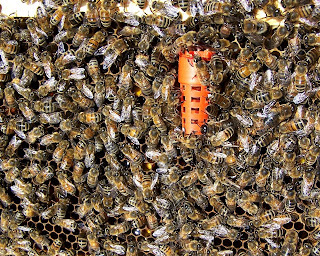 Colonies regularly replace their queen, often more frequently than the beekeeper realizes. Some races of honey bees continuously build queen cells as a survival strategy: A new queen is always readily available if needed. As long as the existing queen remains productive, laying plenty of eggs and producing ample pheromones, the extra queen cells are destroyed by the workers before new queens emerge. The Russian queen held in a plastic marking tube was reared in a queen mating nucleus hive from a queen cell that I cut from the comb of one of my hives. By continuously evaluating queens, the beekeeper can choose ones that have the best traits for survival in the local region. Those are the queens one would like to have producing new generations of queens. This queen will be observed over her lifetime for over-winter survival of the colony, spring-time population buildup, behavior on the comb, brood pattern, honey production, and gentleness. The dot of white paint on her thorax will tell me that she has not been superseded. A honey bee colony can be no better than its queen. Producing a good queen requires good bee genetics, nutrition, and successful mating with good drones. Queens may be produced in queen mating nucleus hives from larvae grafted from the beekeeper’s best honey bee stock or from supersedure or swarm cells found in existing bee hives. Queens may be produced entirely by the bees themselves if the beekeeper moves frames containing eggs and very young larvae and places them in a nucleus hive set-up to accept them. This nucleus hive is prepared a day in advance with frames of open brood, nurse bees, and frames containing pollen and honey. In this case, the hive may be considered a “walk-away” split, since it requires no attention by the beekeeper after it is set up. There are also non-grafting techniques for producing queens. Any of these methods area capable of producing good, productive queens. However, things can go wrong; and poor queens may result if conditions are not right. For example, the genetic mix of the queen and the drones she mates with must be well suited for the local environmental conditions. The nucleus colony must have adequate food to nourish the developing queen, particularly a diversity of pollens to provide all of the necessary proteins, vitamins, and minerals. There must be an adequate population of foraging worker bees to gather food if it is not supplied by the beekeeper. There must be plenty mature drones in the area for the queen to mate with. Finally, weather conditions must be suitable for the young queen to make her mating flights. The first sign of the queen’s successful mating is the presence of eggs. Click of today’s photo to see a new, dark-colored queen that failed to develop into a productive egg laying “mother” for the colony. Actually she became smallest bee in the hive. Still, the workers are attracted to her pheromones and attend to her. She will be replaced. 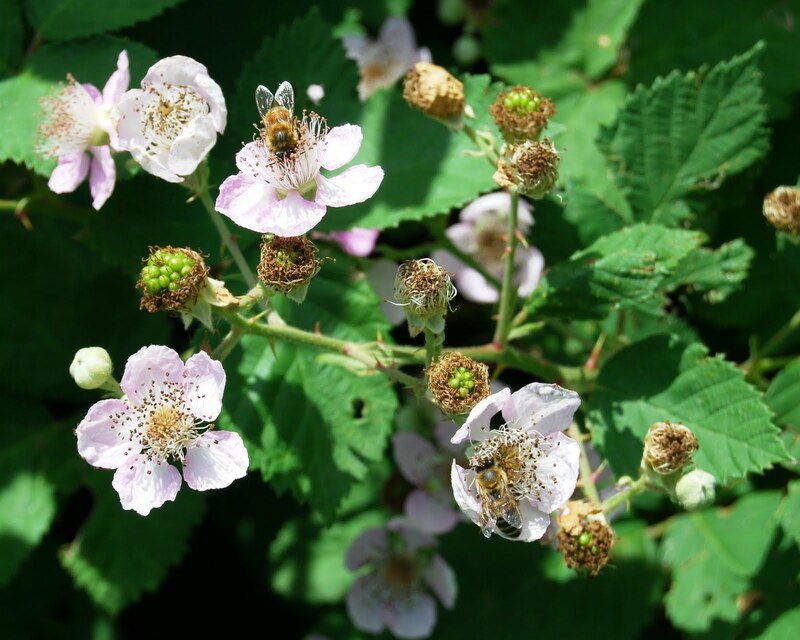 The bloom of the blackberry is milestone on the beekeeper’s calendar. Shirley Murphy told me her Tennessee River bees were bringing in large amounts of light gray colored pollen. When I took today’s picture, I knew the source of the pollen: blackberry. I had noticed my Arkansas Delta bees bringing in large amounts of the light gray colored pollen along with bright yellow pollen. After several days of cool, rainy weather, the sun broke out of the clouds briefly; and the bees burst from their hives and converged on blackberry thickets in great numbers. Blackberries are an important source of pollen for honey bees feeding a large population of brood. The blackberry is a vine in the important family of bee plants, the roses. Members of the rose family supply great amounts of nectar and pollen to honey bees and native pollinators. Other roses include the flowering rose plants and a number of vines: greenbrier, raspberries, and strawberries. A number of roses are shrubs and trees, including hawthorns, apples, almonds, apricots, peaches, cherries, plums, pears, and crabapples. Today’s photo shows honey bees pollinating blackberry flowers. As the bees scrub through the flowers, they transfer grains of pollen from the exposed anthers to the sticky stigmas, allowing the plants to produce fruit and seed. Since blackberries bloom over a rather long period of time, there are buds, flowers, and unripened fruit showing in the picture. Later, there will be dark, ripe fruit as well. Cultivated blackberries are a favorite for pies, jams, and jellies. Wild blackberries provide food for songbirds and wildlife. Seeds are dispersed by birds, and 10-foot-tall blackberry thickets grow rapidly in full sun. In colonial times, the tough vines of blackberry plants were stripped of their thorns, and then they were used to bind bundles of straw to build skeps and roofing thatch. Skeps are dome-shaped bee hives that look like inverted straw baskets. Honey bees were brought from Europe to North America aboard sailing ships in skeps. We are four years into the greatest recorded die-off of honey bees. Since the spring of 2007, beekeepers across North America have experienced colony losses averaging 30 percent each year, typically over the winter. Studies of the causes of the losses, known as Colony Collapse Disorder, have been made and continue. Much more is now known about the factors affecting honey bee health. However, a single source of the condition which results in the loss of a hive’s adult population has not been identified. It seems that multiple conditions exist when colonies collapse. The first common element identified with the honey bee die-off is colony stress. Bees may be under stress from confinement due to transportation for pollination service or from nutritional deficiencies caused by weather, lack of bee plants in monoculture agriculture, or from exposure to insecticides and chemical toxins in the environment. Initial reports of the causes of Colony Collapse Disorder identify honey bee viruses, often vectored by parasitic Varroa mites, and a new strain of Nosema disease, Nosema ceranae. Still unanswered is the effect on honey bees of the use in the environment of neonicotinoids, systemic insecticides brought back to the hive by bees foraging for nectar and pollen. Of special concern are imidacloprid and clothianidin. Their safety is strongly questioned by beekeepers. Study, independent of the chemical manufacturers, is needed to assure their safety. Colony Collapse Disorder has changed beekeeping over the past four years. The public has become acutely aware of the honey bee’s role in producing our food. Beekeepers have adjusted their management practices to control bee diseases and keep colonies healthy. 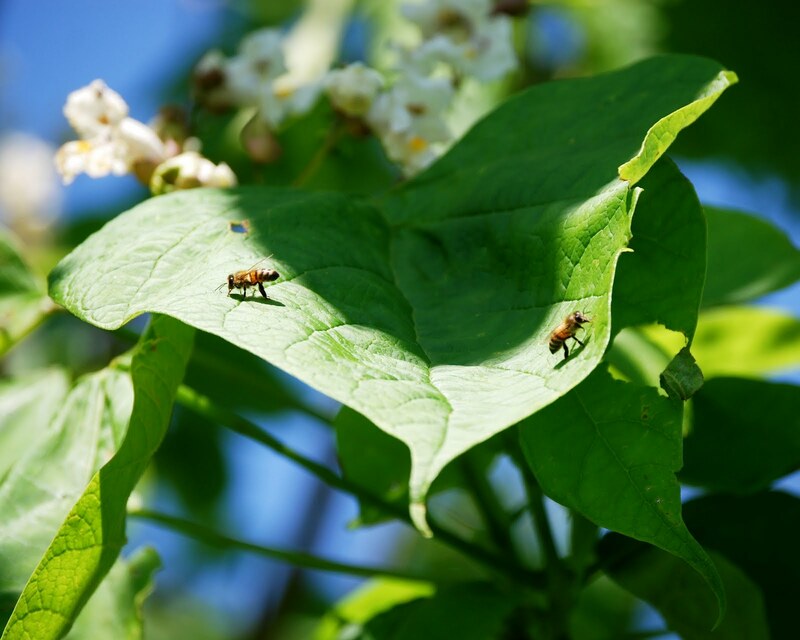 There has been a shift from the use of harsh chemicals for parasitic mite control to less stressful or chemical-free measures. The importation of honey bees into the United States, allowed in 2006, is again blocked. Breeding bees resistant to the effects of parasitic mites is increasingly the promise for healthier honey bees. Today’s photo: foraging pollen from native Arkansas dogwood trees. Beekeepers receive many calls from people who find bees in trees. 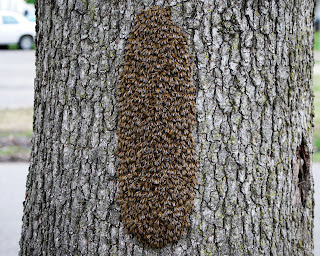 Particularly in the spring, these are swarms of honey bees hanging from a limb. It is also common for homeowners to find honey bees living in a hollow cavity in a tree in their yard. The tree may have been occupied by bees for a long period of time, but the bees are unnoticed until warm weather brings about increased flight activity. When one receives a swarm call, it is best to quiz the caller for as many details as possible. I received a message that there were bees on a tree limb exactly seven and one-half feet above the ground. This would be a perfect opportunity to try out my new swarm collecting device that I built from a design shown on John Jones’ Stone Mountain, Georgia beekeeping blog at http://stonemountaingeorgiabeediary.blogspot.com/2011/05/swarm-catcher-5-gallow-water-bottle-in.html. The device is a plastic jug mounted on an extension pole for safe removal of bees in a tree while standing on the ground. 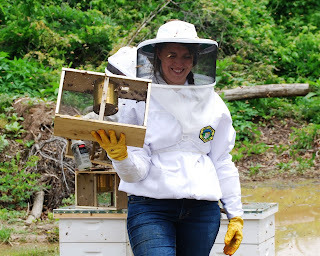 I loaded my truck with a swarm box, bee hive, feeder, syrup, a bee suit, veil, and tools. Next, I called to get exact directions and clarify details from the homeowner. 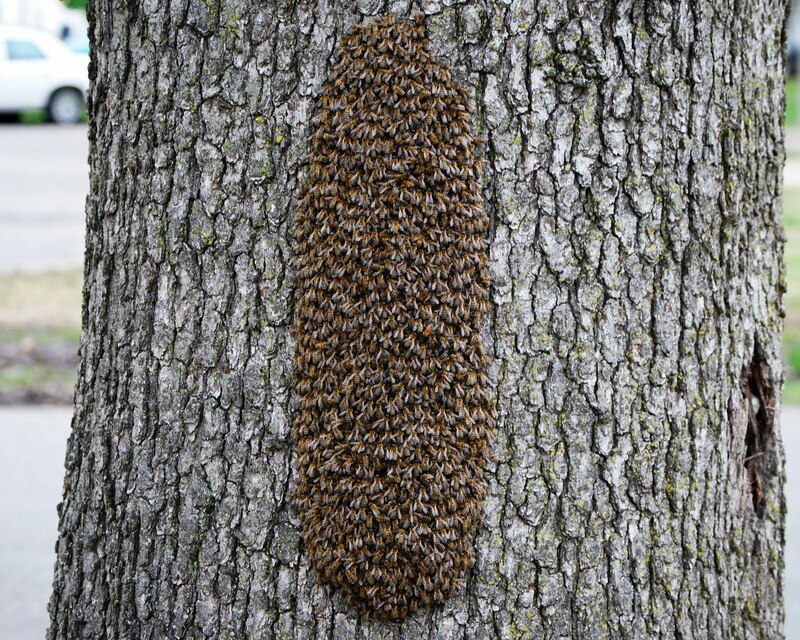 He finally described the bees as being one cupful of bees, a rather small swarm, possibly from the colony that he had an exterminator spray inside the tree. He read out a list of three insecticides that had been sprayed or dusted on the bees plus an adhesive sealant sprayed into their nest. He asked me if I reckoned that spraying had hurt the bees, and did I want them. I told him that I had no use for dead bees. Remarkably, this was not my only call to collect dead bees. The other recent caller wanted me to pick-up dead, insecticide-sprayed bees so that they would not come back to life and harm her. Today’s photo is a swarm of live bees I collected from the surface of an oak tree. Much of the craft of beekeeping involves positive and negative experiences being passed along among beekeepers. Recent blog pieces involving installing packaged honey bees brought comments and questions from several places around the world. Discussion came from Russia and New Zealand as well as several locations in the US. New beekeepers were interested in gaining insights from successful package installations, and seasoned beekeepers were willing to share their experiences. Two specific topics were discussed: wetting the honey bees before placing them in the hive and methods of placing the bees in the hive. I like to give a package of bees a light spraying of sugar water as soon as I receive it to help hydrate the bees after shipment. Before hiving the bees, some beekeepers like to moisten the bees’ wings with sugar water. The wet bees are not as eager to fly, and they may be easier to house in a new hive. In either case, it is important to be careful not to chill bees by spraying them if the weather is cool. The other topic discussed among beekeepers involved placing a sheet of cloth on the ground and allowing the bees to walk across it to the hive’s entrance. If a queen, confined in the hive, is emitting strong pheromones, workers will fan pheromones at the hive entrance and attract colony members to the hive. If all goes well, the bees “march” into the hive. The problem that may arise is that packaged bees are often not organized as a colony. Bees poured onto a cloth may merely fly away. A safer introduction method may involve pouring the bees directly into the hive. For different perspectives on beekeeping, see http://ludditeapiary.blogspot.com and http://kiwitopbarhive.blogspot.com. Each descriptive writer keeps bees in a different type of hive using similar beekeeping principles. The Luddite keeps bees in Warre hives; Marcia uses Kenyan top bar hives. 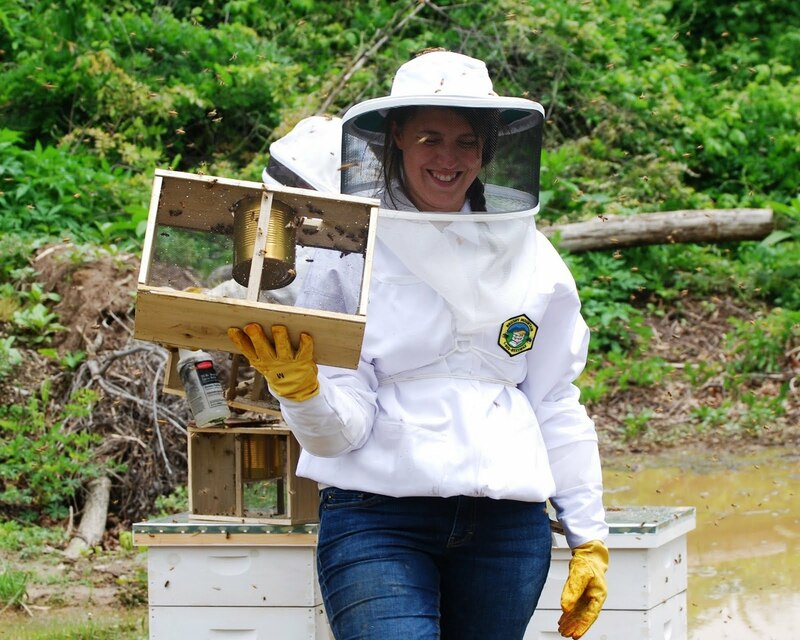 In today’s photo, Mary Phillips successfully completes installing packaged bees in Langstroth hives. Each shares ideas. 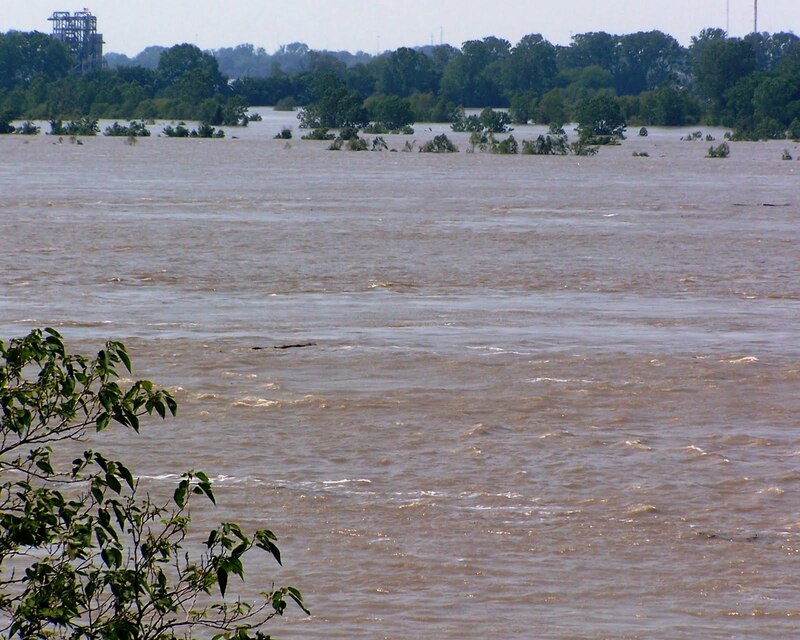 The Mississippi River crested today at the highest level since the Great Flood of 1937. Swollen by melting snow in northern regions and heavy spring rains, North America’s largest river rose to within a foot of its all-time record. I took today’s photo from atop Chisca Mound in Memphis, Tennessee, a city built on high ground known as the fourth Chickasaw Bluff. Trunks of massive trees drift in the fast-moving current. 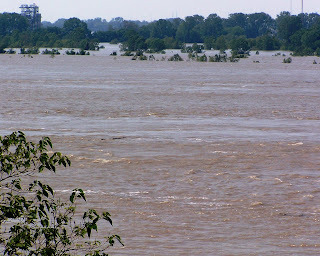 The tops of tall cottonwood trees can be seen one mile away, marking the river’s west bank and the Arkansas Delta. Seven miles, straight ahead, beyond the river’s main earthen levee, sits the city of West Memphis, Arkansas; fifteen miles ahead is Peace Bee Farm. This year’s flooding along the Mississippi River has had an effect upon both managed and natural honey bee colonies. The Memphis Area Beekeepers Association lost several hives when its bee yard was flooded by waist-deep waters of the Wolf River, a tributary of the Mississippi. Swarms that I captured this week near the Mississippi River in Arkansas may have been driven from natural nests in the cavities of trees by rising waters. Some of the honey bee colonies clearly perished, but many of the resilient bees seem to have escaped flooded trees and floating hives. Humans, like honey bees, are social beings. We accomplish more as a community than could be possible as individuals. Designing and building a levee system to protect from powerful forces like a once in a hundred year flood requires the combined efforts of many. Viewing the Mississippi River above flood stage is humbling. Another thing comes to mind: All of this water draining from 31 states was carried by clouds and deposited as rain or snow. As the climate warms, one of the effects will be increases in mighty floods. Native Americans, like the Chisca, moved into the rich river bottom lands to hunt and farm, and then retreated to high ground when the Mississippi floods each spring. Flowering plants attract honey bees and other pollinators as a method of moving pollen within and among flowers to reproduce the plants. To attract the pollinators, plants emit fragrances, display colorful flowers with intricate shapes, and offer tasty and nutritious foods. 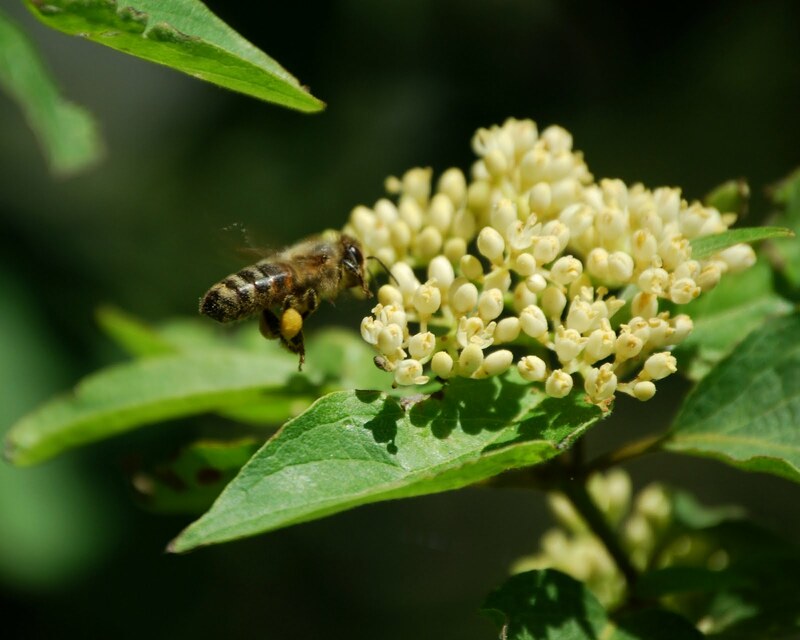 The foods are carbohydrates from nectar and proteins, fats, vitamins, and minerals from pollen. Nectar is usually secreted by the flowers. Honey bees are directed to the nectary, the nectar-bearing part of the flower, by ultraviolet nectar guides. The nectary is usually located in the center of the flower. However, nectar is secreted by some plants in areas outside of the flowers. 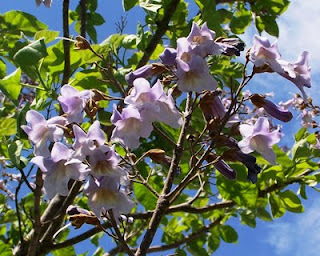 Among the plants with extra-floral nectaries is the catalpa tree, which is now in bloom. Today, I watched a Baltimore oriole feeding on nectar in catalpa flowers. Honey bees were flying into the large bell-shaped white catalpa flowers, and they were also working extra-floral nectaries on the large catalpa leaves. The leaves secrete sugary nectar to attract pollinators like the bees in today’s photo. 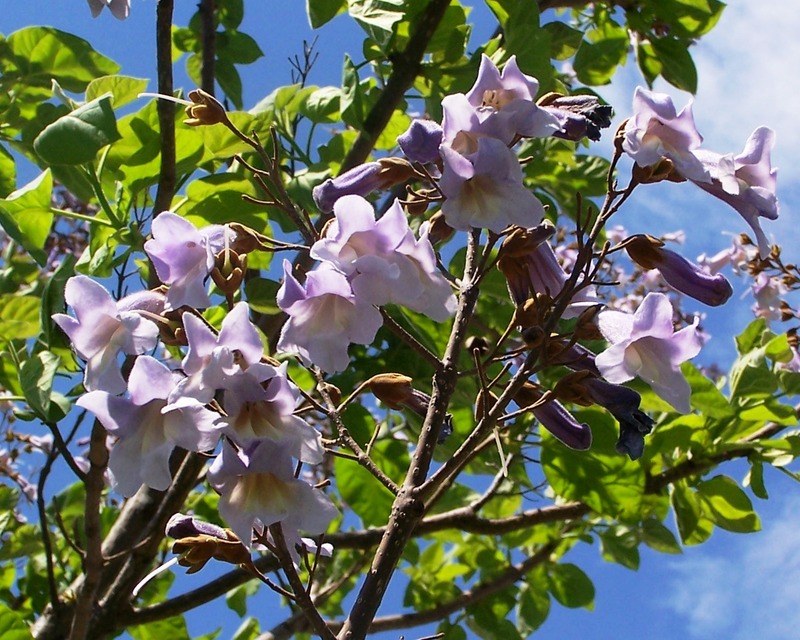 Catalpa trees are members of the trumpet creeper family. After pollination, catalpa produces wind-dispersed seeds that hang in long pods. Cotton is another flowering plant that secretes large amounts of nectar outside of the flower. After the first day’s bloom, which yields nectar from the blossom, cotton secretes nectar from bracts, leaf-like parts outside of the flower, and from leaves. Other plants have flowers that make it difficult for some pollinators to access the nectary. Honeysuckle flowers have a long bell-shaped flower making it difficult for honey bee tongues to reach the nectar. However, honey bees can access honeysuckle nectar after leaf-cutting bees chew through the side of the flower. Honey bees follow leaf-cutting bees to forage on hosta lilies as well. To access the nectar of alfalfa, honey bees must trip a trigger in the flower which delivers an annoying slap in the bee’s face. The foraging techniques used by honey bees to access the nectar of different plants are learned behaviors. Beekeepers typically produce their queen bees in small hives called queen mating nucleus hives. Nucleus hives are any hives that are smaller than full size bee hives. Honey bees produce queens anytime from spring through fall; however, they produce them in greater numbers in the spring. For the bees, this spring-time queen production matches their tendency to divide the colony and swarm. 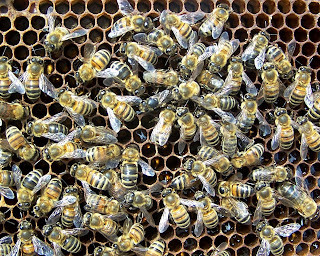 Beekeepers take advantage of the spring-time tendency to produce queens in order to expand their beekeeping operation or replace colonies lost over the winter. A queen cell is placed in a queen mating nucleus hive by the beekeeper two days before the queen emerges as an adult. Today’s photo shows a queen cell in a plastic protective holder, positioned vertically, pushed into the surface of the comb. 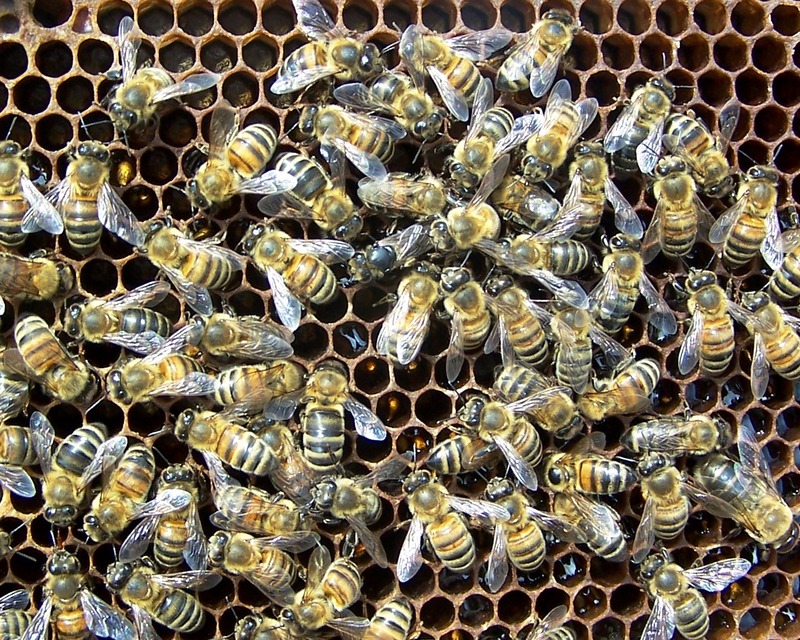 The queen cell may have been developed from beekeeper-grafted larvae reared in a cell builder hive or produced by bees in an existing hive as a swarm cell or supersedure cell. Productive queens come from good genetic lines and receive complete nutrition and effective mating to high-quality drones. The queen mating nucleus hive is a queenless colony set-up to care for a developing queen bee. The nucleus hive contains frames of nurse bees and brood. Capped brood contains pupae that will soon emerge as adults. These young adult workers produce food for the developing queen. Open brood emits strong pheromones to hold nurse bees in the mating nucleus hive. Frames of honey and pollen ensure the new queen receives nutritious food for proper development. After the virgin queen emerges from her cell as an adult, she roams the combs of the mating nucleus hive for five or six days. Then she makes a series of mating flights, mating in flight with 12 to 20 drones. Afterward, she flies back to the same nucleus hive. In five or six days, she begins to lay eggs. The beekeeper can then begin evaluating the quality of the queen in the mating nucleus hives. One of the most common ways for beekeepers to establish a honey bee colony is by purchasing a package of bees. Commercial beekeeping operations prepare the packages, which can be delivered by truck or shipped. The package is a wooden box with screened sides for ventilation. The box includes one queen bee housed in a cage, roughly 12 thousand worker bees, and a can of sugar syrup. The queen often shares her cage with five or six attendant bees to feed and care for her. The can of sugar syrup is slightly perforated to allow it to drip to provide food and moisture for the bees while they are housed in the package. 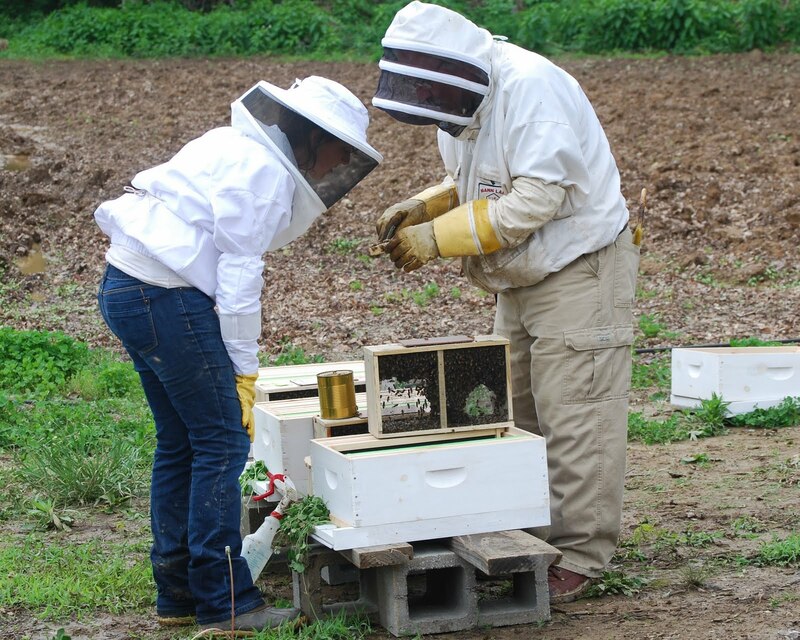 Prepared in the Deep South, packaged bees are often shipped across the US in April and May. The packages are made-up of bees shaken from the frames of numerous production hives. The caged queen and her attendant bees are taken from queen mating nucleus colonies after the queen begins to lay eggs, indicating that she is successfully mated. At the time that the package is produced, it cannot be considered a colony. 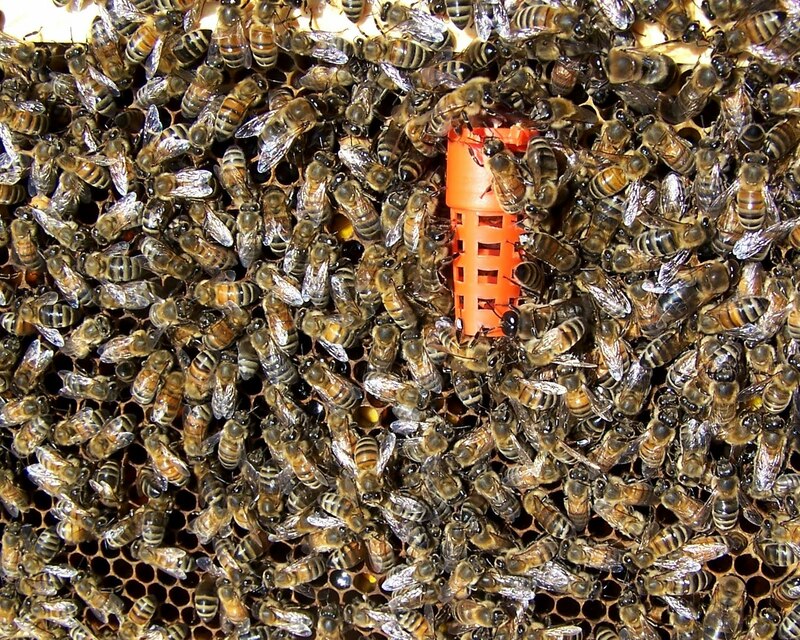 The bees become organized as a colony after they get accustomed to the queen’s pheromones. To prevent the disorganized bees from merely flying away before they become a colony, I like to confine them in the hive. This week I assisted several beekeepers install packages of bees. In today’s picture Mary Phillips and I block the entrance to three hives with clover to temporarily prevent the bees from leaving the hives. Mary sprays the inside of the hive and the surfaces of the frames with sugar water scented with spearmint and lemongrass essential oils. The can of syrup is removed from a package, and we inspect the queen in her cage. 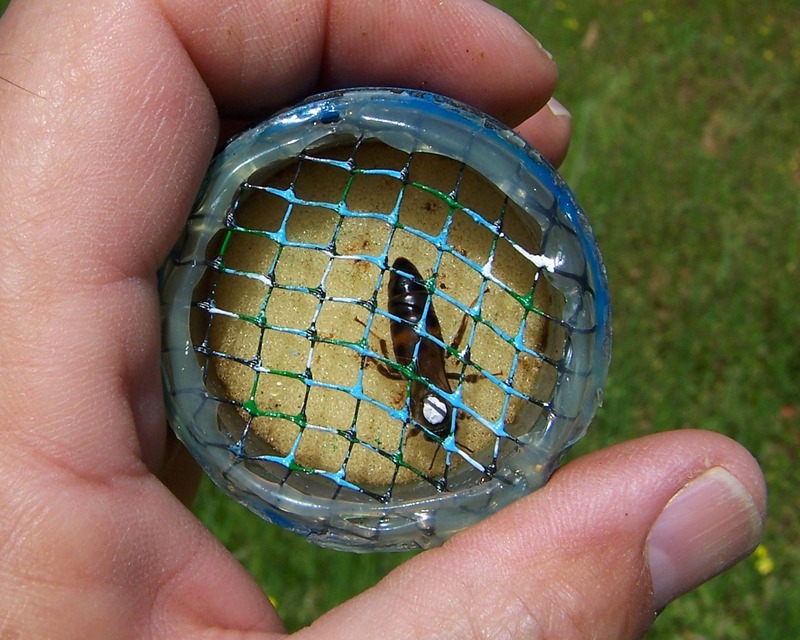 We expose the candy plug that the bees will chew through to release the queen from her cage. Feeders supply the bees with syrup to help them secrete beeswax they use to build honeycomb. The mid-section of the United States is the only area in the world that regularly sees tornadoes. Each spring violent thunderstorms develop as warm, damp air rising from the Gulf of Mexico is met by strong cold fronts sweeping down from arctic regions. Atmospheric conditions are made unstable by jet stream currents, high-altitude, high-speed winds that shear the tops off clouds and twist storm cells. The result is violent thunderstorms with torrential rains, numerous lightning strikes, large hail, tornadoes, and strong winds shearing downward at high speed. A series of thunderstorms left a path of death and destruction across the South. Friends from the Birmingham, Alabama region experienced exceptionally large and powerful tornadoes. Many lives were lost in Tuscaloosa, Huntsville, Hueytown, and Concord, Alabama. While communications from the affected areas of Arkansas, Tennessee, Kentucky, Mississippi, Alabama, Virginia, and Georgia have been difficult, it appears that over three hundred deaths resulted from this one series of storms, the latest in four weeks of continuous storms. I encourage anyone who would like to contribute to responsible agencies, such as the American Red Cross, to direct cash gifts to the capable relief workers assisting the affected citizens recovering from the storm damage. Today the empress tree is in bloom. Whenever I see the large pink to violet bells of the empress tree, I remember seeing them covering Red Mountain in Birmingham, Alabama. These trees, imported from China, as ornamentals escaped into the countryside. Tiny seeds of the empress tree are blown by the winds to propagate this woody member of the important family of bee plants, the figworts. Honey bees can be seen moving about the clusters of large empress tree flowers on the limb tips high in the treetops. Today’s picture is an empress tree blooming in downtown Memphis, Tennessee. The tree, purported to be a gift to Jefferson Davis’ wife, came from the Forbidden City of China. Hopefully, the seeds of empress trees will be distributed by more gently winds.